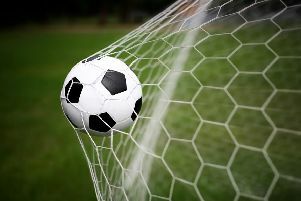 Honours finished even as the season ended for Pagham and Chichester City at Nyetimber Lane – the Lions coming from behind to grab a 1-1 draw with their near neighbours. The Lions fielded a much-changed side, bringing in several youngsters after Wednesday night’s 4-0 loss to the same opponents in the RUR Cup final, which resulted in much more energy but nowhere near as much skill and composure. Chi took the lead after just 75 seconds when Jimmy Wild rose unopposed at the far post to nod a free-kick into the roof of the net, his third goal against Pagham in four days. It could, probably should, have been 2-0 a couple of minutes later when ex-Pagham legend Scott Murfin sent a 20 -ard drive just past the post. Pagham slowly clawed their way back into the game and Chi keeper Ender had to be at his best to save a Lloyd Rowlatt shot and then to push a dangerous Ryan Cox cross to safety. James Thurgar and Callum Overton both had half-chances saved or blocked as Pagham continued to press but it was the Lions goalkeeper James Binfield who had the last save of the half to make when he pushed a low shot around the post five minutes before the break. It was a truly memorable goal for the Lions as it brought up the 100-goal mark in the league for only the second time in the club’s 115-year history. Pagham continued to push forward as the second half began and Overton drove a shot from the edge of the penalty area straight at Ender. Just after the hour Scott Rafferty was booked and Binfield made a sharp save from the resultant free-kick. Thurgar was booked soon after for arguing with the referee and skipper Jamie Horncastle was replaced by Andy Chick as the game started to get ragged. On 69 minutes Thurgar was brought down from behind in the box and Overton sent keeper Ender the wrong way from the spot to make it 1-1. Two minutes later that man Wild brought out the best in Binfield once again, but the game then fizzled out as end-of-season affairs often do. Rafferty was replaced by Charlie Selby and Johan van Driel by Tom Gannon for the Lions. Overton did have the ball in the net near the end but was adjudged to be offside. Pagham: Binfield, Wiggans, Cox, Bingham, Wollers, Horncastle (Chick), Thurgar, Rafferty (Selby), van Driel (Gannon), Rowlatt, Overton. Subs not used: Jefkins, Jones. Chi: Ender, Williams, French, Pashley, Lee, Martin, Peake, Hegarty, Murfin, Wild, Dolcetti. Sub: Ayling.